Sonny holds a gun on AJ, and warns him there is no place to hide. Sonny vows AJ will pay for killing Connie. AJ’s confused, but Sonny tells him Connie named him as the killer by writing his name in her blood. AJ insists he didn’t do it, but Sonny wants him to confess and die with a clear conscience. Otherwise, Sonny will make AJ&apos;s death slow and painful. Dante promises Olivia he’ll find who did murdered Connie. Olivia worries about where Sonny would go, and manages to see the AJ sign beside Connie’s body. Olivia realizes Sonny went after AJ, and hopes he kills AJ. She doesn’t understand the point of her visions, if she can’t help the people she loves. Lulu finds Spinelli watching the baby. He asks if she’s seen Maxie yet, and Lulu explains to him Maxie suffered a crisis, but is okay now. She tells him Maxie wasn’t coherent, and kept repeating the baby was hers and Spin’s. Lulu wonders if Maxie has residual feelings for Spin, but points out he’s with Ellie. Spin informs Lulu he and Ellie are over. Carly runs into Morgan and Kiki, who are putting up flyers trying to find Franco. Carly figures Franco is running from the charges against him, but Kiki knows it’s because he found out he wasn’t her father. Ellie heads up to the roof, and runs into Franco when she arrives there. He complains about no one caring for him, but she shows him one of Kiki’s flyers. Ellie mentions she lost her boyfriend, because she lied. Franco tells her to jump. Franco was lied to for 21 years, and doesn’t know why. Ellie is sure there is another side to the story, and mentions Franco has done plenty wrong to others as well. Ellie heads down from the roof, and tells someone to call security because Franco is on the roof. Carly heads up there, and offers her sympathy for his cancer diagnosis and subsequent inability to help Danny. Franco wanted a relationship with Kiki, and wonders who he’ll prove himself to now. Carly believes he can prove himself to her, if he wants to atone for his sins. He can’t take the easy way out. Carly wants him to prove to her that he has changed. Franco follows her off the roof. Ellie runs into Spin, and tells him she won’t give up without a fight. He walks away. Dante gets to the mansion and tells Michael that Connie is dead and AJ is the suspect. Michael refuses to believe it, until Dante tells him Connie wrote AJ&apos;s name in blood. Dante warns Michael not to protect AJ, because he’ll regret it, much like Dante regrets protecting Sonny. Michael and Dante get to the den, as Sonny is about to kill AJ. They stop him just in time. Dante is there to arrest AJ, and swears he will pay. However, Sonny declares he’s going to handle things, and no one can stop him. Michael begs Sonny to stop. He tells Sonny if he kills AJ, he’ll go to prison and be taken away from his kids. Michael will lose both his fathers, and promises the court will make AJ pay. Once again, Sonny refuses to stand down. In turn, Michael vows to never look him in the eye again, if he kills AJ. 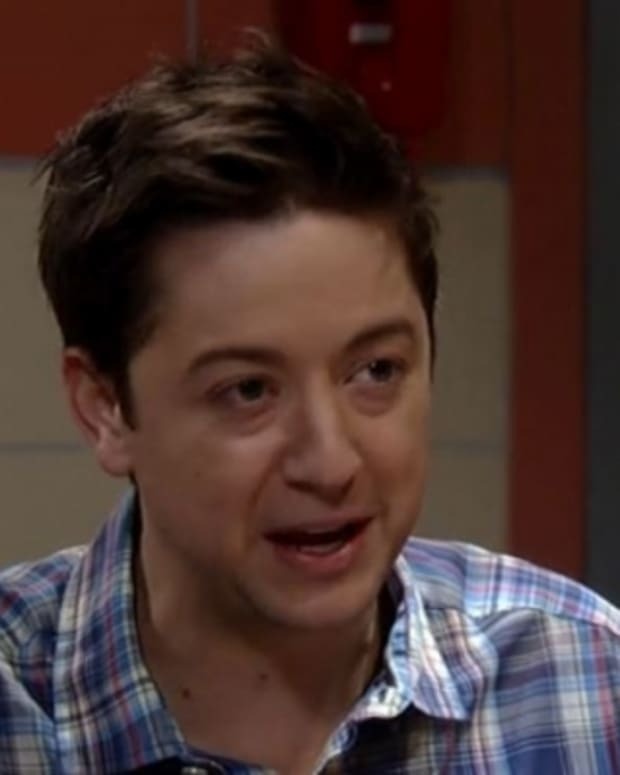 Sonny will be nothing to Michael if kills his biological father. Sonny puts the gun down, and tells AJ that Michael is the only one who could have stopped him. He warns Dante to make sure AJ pays. AJ thanks Michael for saving his life. Dante tells AJ he will suffer the consequences for Connie’s death. Olivia is upset the last time she saw Connie they had a fight, and she’ll never get to say she’s sorry. Alexis offers her comfort. Sonny returns to the office, as Connie’s body is being wheeled away.